The tryout participants gather at mid-field at the end of preliminary drills. Jonathan Hule was "chasing a dream." 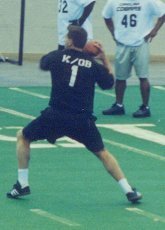 Hule, a Charlotte native who played football at West Charlotte High School, was one of about a hundred optimistic football players who shelled out $50 each to participate in the Cobras' open tryout March 10 at Dorton Arena in Raleigh. They must have known that they had little chance of earning a spot on a team stocked with players who had been on NFL rosters and played professionally for years. Yet they came. They came in athletic shorts, warm-up pants and football shoes, wearing the T-shirts they were given to color-code them by position and number them for easy reference. 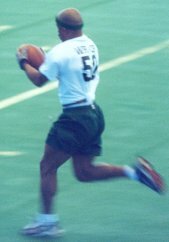 Jogging in place and bouncing up and down on the balls of their feet, they filled the chilly arena with nervous chatter, shouted support and dreams of gridiron glory. The power of that dream propelled them from the ground as their vertical leap was measured in the arena lobby, flowed through their arms with each bench press, streaked behind them during the forty-yard dash. And then it sat with them when they waited, nervous, as the coaching staff huddled for half an hour. Coach Doug Kay finally stepped forward, the difficulty of the task before him evident on his face. "I'll just do this by number," he said, quietly, and proceeded to call out the list of those whose dream was alive for a while longer. A small group each of fullback/linebackers and wide receiver/defensive backs, along with the three quarterback prospects, was asked to stay. The rest of the players, including all of the linemen, received the team's thanks and were sent home. Among those not on the list was fullback/linebacker #2, Jonathan Hule. As others hurried down to the field to warm up for round two of the tryouts, he sat in thought for a moment before slowly pulling on his jeans and shirt and leaving the arena behind. That Platt and the others there even had the chance says something about the Cobras. Kay, general manager Brett Bender, and the coaching and front office staffs all had other things they could have been doing, with the season just weeks away and a score of details clamoring for attention. But there was Kay, directing the players, watching over the passing drills, offering advice to receivers as they ran back down the field after diving for an overthrown ball. There was Mike Neu giving pointers to the quarterbacks, there were Ken Matous and Emerson Martin working with the FB/LB prospects, shouting encouragement, not for a prized free agent or a blue-chip rookie, but for no-names, regular guys... guys chasing a dream. It's a dream whose sheer power I didn't grasp until I sat there that morning, watching these players lay it all on the line for a shot to play professional football. It’s a dream that drives people to set all odds aside, to ignore every rational fiber inside of them, to work and sweat and toil, all to get a chance to play for us, the fans. This is the dream that makes football great. A WR/DB makes a catch during passing drills. QB prospect James Platt takes aim downfield during passing drills. 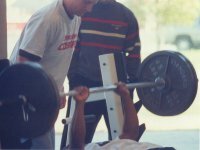 A WR/DB hopefull strains under 90 pounds of bench press weight.